165 pages | 23 Color Illus. | 122 B/W Illus. External-beam radiotherapy has long been challenged by the simple fact that patients can (and do) move during the delivery of radiation. Recent advances in imaging and beam delivery technologies have made the solution—adapting delivery to natural movement—a practical reality. Adaptive Motion Compensation in Radiotherapy provides the first detailed treatment of online interventional techniques for motion compensation radiotherapy. Medical therapy with external beams of radiation began as a two-dimensional technology in a three-dimensional world. However, in all but a limited number of scenarios, movement introduces the fourth dimension of time to the treatment problem. Motion-adaptive radiation therapy represents a truly four-dimensional solution to an inherently four-dimensional problem. From these chapters, readers will gain not only an understanding of the technical aspects and capabilities of motion adaptation but also practical clinical insights into planning and carrying out various types of motion-adaptive radiotherapy treatment. "The book has contributions from many eminent scientists and each chapter is well written and informative. 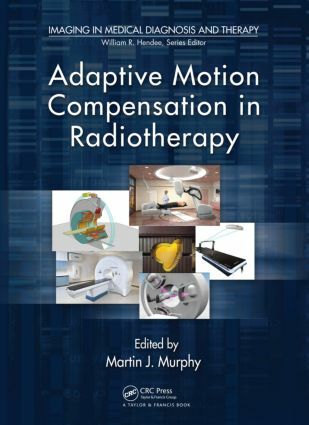 … an informative and useful book that will be of particular interest to those seeking an overview of the different means of achieving adaptive motion compensation in radiotherapy that either are or may be available in the near future." Dr. Martin J. Murphy received his Ph.D. in physics from the University of Chicago in 1980. Following postdoctoral fellowships in nuclear physics at the University of California/Berkeley and the University of Washington and a stint as a research scientist in gamma-ray astronomy at the Lockheed Palo Alto Research Laboratories, he entered the field of radiation therapy research and development in 1992 as Director of System Development of the CyberKnife at Accuray Incorporated. In 1995, he joined the Department of Radiation Oncology at Stanford University as a senior research scientist to continue development of the CyberKnife’s image guidance and target tracking capabilities. In 2003, Dr Murphy joined the Department of Radiation Oncology at Virginia Commonwealth University, where he is presently engaged in several research programs involving medical image registration, CT reconstruction, and real-time motion-adaptive control systems.